1.1. All orders for products are subject to availability and we reserve the right to refuse to supply to any individual or company. 1.2. Your submission of an order represents an offer to purchase the products indicated by you and is not binding on us until we have accepted your order. This means that if a product is shown on our site but is not available or is incorrectly priced or otherwise incorrectly described or if we are unable to arrange delivery to your address or wish to decline your order for any reason, we won’t be obliged to sell you that product in which case we will let you know and will not charge you for the product. 1.3. Shortly after we receive your order, we will acknowledge it by email, detailing the products you have ordered. This email is issued automatically and doesn’t mean that your order is accepted. 1.4. Acceptance of your order for a product and completion of the contract between you and us will take place when we dispatch the product to you. Any products on the same order which we have not dispatched to you don’t form part of that contract. 1.5. You are responsible for ensuring the accuracy of the details provided on the order form. 1.6. You are only eligible to purchase 2 units of SecondLife products per month. The allowance of stock refreshes 1 month from the point each unit is purchased. 1.7. You cannot purchase SecondLife and ospreyeurope.com full price catalogue products in the same order. 1.8. Osprey Gift Cards can only be used to purchase ospreyeurope.com full price catalogue products and cannot be used to purchase SecondLife products. The price you pay is the price displayed on our site at the time we receive your order apart from where an error has occurred in displaying the price. Whilst we do our best to ensure that all prices on our site are accurate, errors may occur. If we discover an error in the price of products you have ordered we will inform you as soon as possible and give you the option of reconfirming your order at the correct price or cancelling it. If we are unable to contact you we will treat the order as cancelled. If you cancel and you have already paid for the products, you will receive a full refund. Prices displayed include VAT where applicable. 3.1 All SecondLife Product Conditions and subsequent descriptions as indicated on the SecondLife catalogue are representational of the individual pack listing and every effort has been made to make sure they are as accurate as possible. As New – A product which is in near-perfect condition. Excellent – A product which may have been lightly used. May be somewhat marked, or have discreet repairs. Good – A product which has been moderately used. May have visible repairs, marks or signs of wear. 3.3 All SecondLife products are marked with ‘SL’ or ‘Demo SL’ for Guarantee purposes. We accept Visa, Mastercard, Visa Debit, Solo, and Visa Electron cards. You can also choose to pay via PayPal. We can’t accept payment by cheque. We, Osprey Europe are responsible for the website transaction. When processing a transaction, you’ll be referred to Sage Pay’s (our payment service provider) secure payment page, which is indicated by the https at the beginning of the URL (SSL). By placing an order, you consent to payment being charged to your debit or credit card or PayPal account as provided on the order form. In case of query, please email secondlife@ospreyeurope.com (office hours are Monday to Friday, 8.30am to 5.00pm UK time, excluding bank holidays in England), quoting your order reference number. I’m having problems with making a payment. What should I do? If you are having problems making a payment using the site, please email secondlife@ospreyeurope.com (office hours are Monday to Friday, 8.30am to 5.00pm UK time, excluding bank holidays in England). Please note, whilst we are responsible for the transaction, this is an area over which we have very little control. My payment has been declined. What do I do? What are ‘Verified by Visa’ and MasterCard SecureCode? The payment screen has frozen. What’s happened? I’ve tried to place an order but haven’t had an order confirmation email, although money has left my account. What has happened? First check your email spam folder. The confirmation email will have been sent from care@ospreyeurope.com. If you still can’t see your order confirmation email, please contact our Customer Services Team who will check to see if your order has been placed on our system. If you failed to reach the order confirmation screen it’s unlikely that your order was successful. However, if money has left your account, please be assured that it will be returned by your card issuer or PayPal. Osprey Europe will only keep a payment once an Order Number has been issued, and the items purchased have been dispatched. I suspect that someone has fraudulently used my card to order from your site. Can I use an Osprey Gift Card to pay for my SecondLife order? 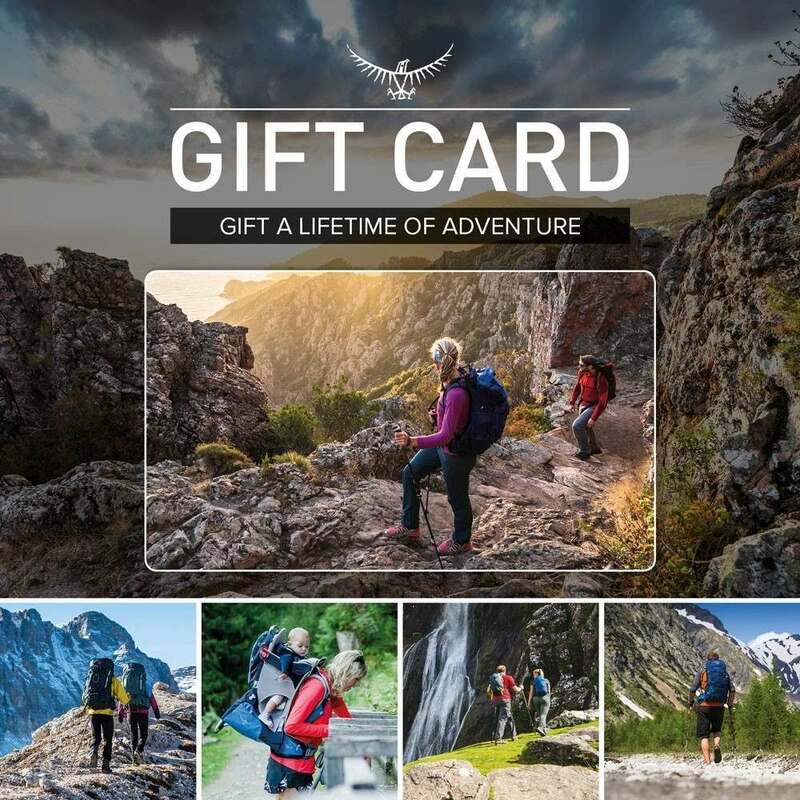 Osprey Gift Cards can only be used to purchase ospreyeurope.com full price catalogue products and cannot be used to purchase SecondLife products. How long should I allow for my parcel to reach me? Our standard delivery is up to 6 working days, depending on the country to which the parcel is sent. Please note that adverse weather conditions and other circumstances beyond our control can seriously impact these delivery times. We make every effort to deliver products within the above timescales, however delays are occasionally inevitable. If you don’t receive your goods within the time quoted above, please contact customer services by emailing secondlife@ospreyeurope.com. If we fail to deliver your order within 30 days we’ll notify you of the reason for the delay and you may cancel your order and we will provide you with a refund for the products not delivered. We will have no other liability to you in the event of delay in delivery. I don’t live in the UK, can I still order from your website? We currently only ship SecondLife products the UK, Denmark, Finland, Ireland, Netherlands, Poland, Germany, Austria, France, Belgium, Luxembourg, Spain, Italy, Norway, Sweden and Switzerland. Can you ship more than one order at the same time? Can you ship different items from the same order to different addresses? Unfortunately not. If you wish to send items to different addresses please place a separate order for each item. What happens if I am out when the carrier tries to deliver my parcel? At this time, we don’t offer deliveries to BFPO addresses. My order is being delivered to an address outside of the UK. Will I be charged import duty? My order has been delivered, but there are items missing. We’re sorry that you have item(s) missing from your order, but please note that due to the size of our packs, purchases may be dispatched as two separate deliveries. We recommend reviewing your Order Confirmation email first as this will indicate the expected delivery date for each item. The next step would be to track your order online via the carrier’s website, where applicable. If you have checked both of these and you still believe that there are item(s) missing, please contact our Customer Services team by emailing secondlife@osreyeurope.com. Our opening hours are 8.30am to 5pm (UK time) Monday to Friday (excluding Bank Holidays in England). Once I’ve placed my order, can I change the delivery address? Unfortunately, we can’t change the delivery address once your order has been processed. If you wish to cancel your order, please inform us in writing by emailing secondlife@ospreyeurope.com, ensuring you quote your Order Number in all correspondence. Providing your order hasn’t yet been dispatched from our warehouse we’ll happily cancel it for you and process your refund. Once your order has been dispatched you’ll need to wait for it to arrive and then you can return for a refund – see below. Unfortunately, we can’t amend your order once it’s been placed (e.g. change the colour or add another pack). If you change your mind, you’ll need to cancel your order and place another one. What are my rights under the Consumer Protection Regulations? Under the UK’s Consumer Protection Regulations, you have a number of ‘statutory’ or legal rights. One of these is the right to cancel your transaction and receive a full refund. To exercise your statutory cancellation right please notify us in writing of your cancellation by emailing secondlife@ospreyeurope.com quoting your Order Number. We want all of our customers to be 100% happy with their purchase. Except where we have customised a product to your requirements, if you need to return an unused item to us, you can do so within 14 days of receiving it. The returned items must be returned unused and with all original packaging, tags & labels. Note – we won’t issue a refund for products customised to your requirements (unless they are faulty) nor if the product has been used, damaged or tampered with. This does not affect your statutory rights. If you experience a problem with your product once you have used it please see our SecondLife Guarantee page and Returns section if products are faulty. When returning the item(s), please provide us with all original packaging, tags & labels where appropriate. Complete this form to tell us why you’re returning your item. If the product is damaged or faulty, clearly mark what the issues are and where there is damage. Put the item(s) you wish to return in a box taking care to protect the contents. Cut out the return label in the return form and attach to the box. Wrap the original packaging around the box and securely seal it. If the original packaging has been lost or damaged, please use alternative packaging to securely wrap the box. Take the wrapped parcel to your nearest Post Office. We strongly advise that you ask for Proof of Postage or a recorded-delivery service for your peace of mind, as all parcels are returned at your risk. We can’t accept liability for items that are lost in transit. Until the products are returned to us, you must not use them and must take reasonable care of them and ensure that they are returned to us in a re-saleable condition. When making a refund (other than a refund for a faulty product), we will deduct from the sum to be refunded any reduction in the value of the products returned caused by you using or handling the products beyond the manner in which you would handle the products if you were looking at them in a shop in order to establish the nature, characteristics and functioning of the products. Any refund issued under these provisions will be made, using the same means of payment as you used for your order, within 14 days of us receiving the products back. You will not incur any fees as a result of the refund but we will not make the refund until we have received the products back from you or you have supplied evidence of having sent the products, whichever is earliest. If for any reason you suspect that your credit card has been used to make an inaccurate or incorrect transaction through this website, please advise us at the earliest opportunity by emailing our SecondLife Team (secondlife@ospreyeurope.com). We will investigate and arrange a refund as necessary. We’re really sorry that this has happened, and we want you to be fully satisfied with your Osprey product. If you would like to report delivery of a faulty item, please see below or click here to be taken to our Guarantee page. If you receive a product which is faulty, please contact our Customer Services Team as soon as possible. You can email them on secondlife@ospreyeurope.com. Our opening hours are 8.30am to 5pm Monday to Friday (excluding Bank Holidays in England). By law you are entitled to receive products which are as described, fit for purpose and of satisfactory quality and our aim is to make sure that you do. You can find out about your rights as a consumer if you receive faulty goods at the Citizens Advice Bureau’s guidance The Consumer Rights Act 2015. To get your product repaired or replaced, or to receive a refund, you will need to return it to us and our SecondLife Team will help you do this, either by emailing you a free returns label or by arranging collection. Can I return an item to one of your dealers’ stores? No. Any products bought from our website must be returned by post to us, using the returns label provided. When making a refund (other than if the product is faulty) we will deduct from the sum to be refunded any reduction in the value of the products returned caused by you using, wearing or handling the products beyond the manner in which you would handle the products if you were looking at them, or trying them on, in a shop in order to establish the nature, characteristics and functioning of the products. But we’re very sorry if we’ve made a mistake in refunding your order. Do please remember that in certain circumstances we do not refund the delivery charge and will make a deduction for any reduction in value caused by your use of the products – see Refunds. In the event that you’ve received an incorrect refund, please contact our SecondLife Team by emailing secondlife@ospreyeurope.com who will do their best to resolve it quickly and efficiently. Will you inform me once you’ve received my returned product(s)? Yes, we will email you as soon as we have received your returned item(s). Please allow up to 10 days for us to receive your return from the day you posted it if you’re in the UK, or 21 days if you are returning items from outside the UK. We aim to process all refunds within 5 working days of receipt of the returned product or if you cancel before we dispatch the products, of you telling us that you want to cancel your order, although during busy periods this may vary. If you paid by a card, please also allow up to an additional 5 working days for your bank to handle the credit and post it to your account. Osprey Europe has no control over this part of the refund process. Note – we will not make the refund until we have received the products back from you. Can my refund be processed to a different card or account? Our SecondLife Guarantee only covers defects in the way your pack has been built and is valid for 1 year from date of purchase. Should you need to make a claim please complete a Guarantee Claim Form detailing your order number, outlining the nature of the problem and including some photos to illustrate the damage.